In internet, a remote login is the connection established between two terminals, the server and the user. In this case, the connection is made between the projects chosen and the visitor to the exhibition, both in the museum and from home. Remote Login is also na allusion to the relationship established between the user and the artist through this project. Obviously, any work of art can serve as a connection, but in the net.art projects, this function is absolutely basic. Internet is much more than a productive tool, it is a new space for communication, relationships, reflection and action. Its potential is enormous, and it all depends on the use made of it. This selection is not based on a need to monumentalise net.art and much less to objectivise it or turn it into a fetish. Its aim is to establish connections and open up a new area for debate, confrontation and critical analysis. As well as testifying to the ever-increasing and improving digital art efforts, all the projects selected reveal processes in which a large number of people have intervened, dealing with the exchange of information, action and reaction, real problems and situations which demand a stance. Their authors do not expect them to be taken as works of art, but want them to become catalysts for artistic expression and public response, to serve as detonators and to point fingers, to make understanding easy and if necessary, confrontation too. The users are required to take an active part in some of the projects, while others develop in front of their eyes irrespective of their wishes, but all of them are interactive to the extent that they establish a direct, personal and always fresh relationship with the spectators, who are invited to abandon their passive attitude to take part in the dynamics of each piece. 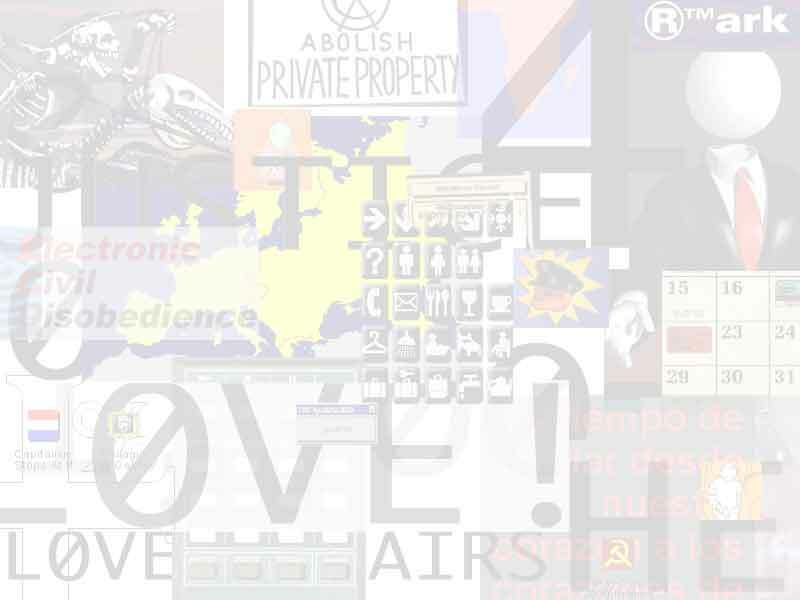 Generally, the projects in net.art were designed to be enjoyed on the users computer screen, with all the peace and quiet, and time, required to explore the many paths and possibilities that they offer. For this reason, we decided to present them to the public in three individual microspaces, where the basic conditions of an individual, private relationship with the machine can be reproduced (with the added advantage of fast downloads, that not all net-users have at home).